This week, several IMS staff members attended the National Neighborhood Indicators Partnership meeting in Dallas. NNIP is a collaboration of the Urban Institute and local partners in 35 cities to further the development and use of neighborhood-level information systems for community building and local decision-making. IMS is the Portland partner. The conference always includes at least one tour of a neighborhood or community development project. I chose the tour of the Cottages at Hickory Crossing, an innovative Housing First community that will serve chronically homeless individuals with a criminal background and history of mental illness. The Cottages community includes 50 400 square foot single-occupancy housing units with on-site integrated health and social services. Rather than transitional housing, these residents will live here forever, with few rules, other than being a good neighbor. Each unit includes a front porch with an Adirondack chair to build community, and everyone gets a key to their home. 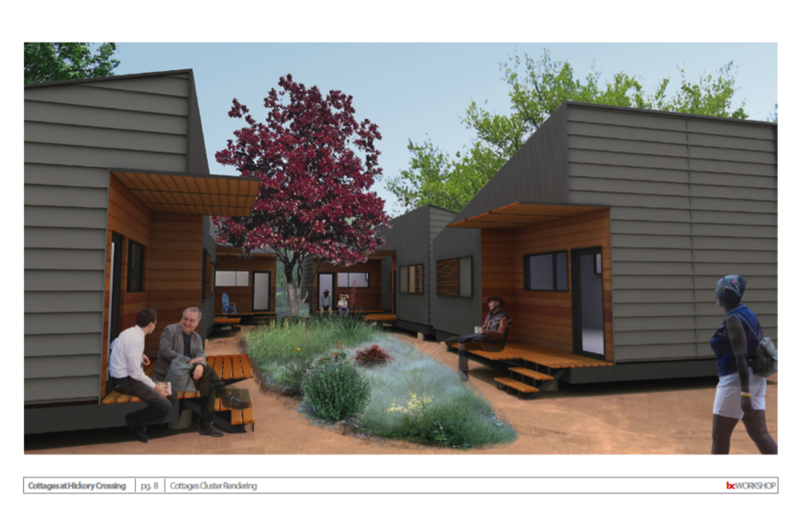 The folks at The Cottages estimate that permanent housing will reduce the cost of services for each resident from an average of $40,000 per year to about $15,000 per year. They will be using evidence-based services and will follow a rigorous evaluation program to measure the results. Wow. With the high rate of homelessness in the Portland region, I wonder if these ambitious ideas can translate to Portland? One of my favorite sessions was about Civic Tech and data ecosystems. Several NNIP partners are participating in a project in partnership with Living Cities and Code for America, to explore how civic technologists, data specialists, and local government leaders can work more effectively together to address pressing problems affecting low-income residents. They are testing the idea that data and tech can only be used to their full potential when an ecosystem of relevant players pool their talents intentionally, in a sustained way, to deepen their collective impact. One great example comes from our partner in St. Louis. Rise, Open Data STL, the City of St. Louis and St. Louis County will collaborate to implement technology solutions to help people navigate the local criminal justice system, including traffic ticket resolution, appearing in court and resolving warrants. Better collection and analysis of data will improve the operations of these systems and help people avoid fines. The partners will also collect stories about people’s interactions with the justice system in order to identify and push for additional solutions. The session leaders challenged us to pick an issue and map the civic and data technology ecosystem of that issue for our region. I can think of many issues in the Portland region that could benefit from a data and technology ecosystem mapping. For each of these issues many players collect, process, and use data. The question is whether they are working together to ensure that different players are working together over time, combining their efforts rather than competing for data, talent, and resources. What should we map: Workforce training? Child poverty? School success? I’m hoping to invite one of these partners to Portland to help us with one of these mappings. I always return from these meetings full of ideas about how IMS can better serve our community with information that informs important policy debates. I’m looking forward to discussing these ideas with my Portland partners!